In 1885, The State University of New York (SUNY) at New Paltz implanted itself as one of the few teaching schools in the Hudson Valley and soon became home to one of the most reputable education departments in New York State. 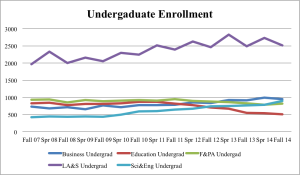 The steady decline in education majors since 2008 comes as a surprise to the school, since overall enrollment at the university has continued to increase. Due to economic trends and their repercussions, students are focusing on more in-demand jobs found in the science, technology, engineering and math (S.T.E.M.) and business fields.